A regional court in the Tambov Region of Russia has delayed a hearing on a petition that could free jailed environmentalist Yevgeny Vitishko until the end of the month, but his colleagues and other ecologists are cautiously optimistic he could be freed. In February 2014, during the Sochi Winter Olympic Games, Vitishko was sentenced to three years in a penal colony for allegedly spray-painting a construction fence around a mansion in in a public Black Sea forest. That mansion was built by Alexander Tkachev, a fierce ally of President Vladimir Putin, and whose region hosted the Sochi Games. A scathing report authored by Vitishko and his colleagues at the Environmental Watch on the North Caucasus produced a scathing report on rampant environmental abuse, contortions of Russian environmental law, summer homes and other sweetheart construction deals on protected Black Sea lands for Putin and his cronies in the build-up to the $51 billion Winter Games. Declared a Prisoner of Conscious for his participation in opposing the Sochi Olympics, Vitishko has become a symbol of vengeance for criticizing the Kremlin’s sacred cows. Sergei Loktyev, Vitishko’s lawyer, submitted a so-called petition for mitigation of punishment to the court in Kirsanov – the town closest to Vitishko’s prison colony – on April 15 and it was rejected. But according to Russian criminal law, people serving a serving custodial sentences can substitute the remainder of their time left to be served to a milder form of punishment after a third of their sentence has been served. In Vitishko’s case, this would likely mean freedom from his minimum security prison colony with certain restrictions, such as not changing address without informing Russia’s penitentiary service, and that he would be home during nighttime hours, Loktev said. Three days ago, judge Sergei Burchevsky granted Loktyev’s motion to enter into record character witness statements for Vitishko from the World Wildlife Fund, Russia, the Environmental Rights Center Bellona, and Duma Deputy Dmitry Gudkov. The judge is also allowing statements on the record from Vladimir Rubashny, an expert psychological witness for the defense. Judge Burchevsky rule to postpone the hearing until June 31. 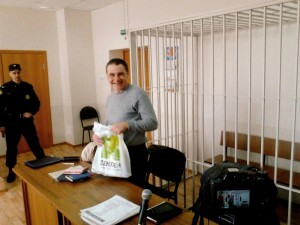 The matter will be heard on the grounds of the Sadovaya Prison Colony, where Vitishko is incarcerated. Andrei Rudomakha, coordinator of the Environmental Watch on the North Caucasus, with whom Vitishko worked until his incarceration, saw the latest court hearing in a positive light. Rudomakha underscored that the July 31 hearing would be Vitishko’s last legal opportunity to turn to the court for early release this year.